This outdoor portable Gojooasis Green house is ideal for protecting your gardening from any weather conditions. 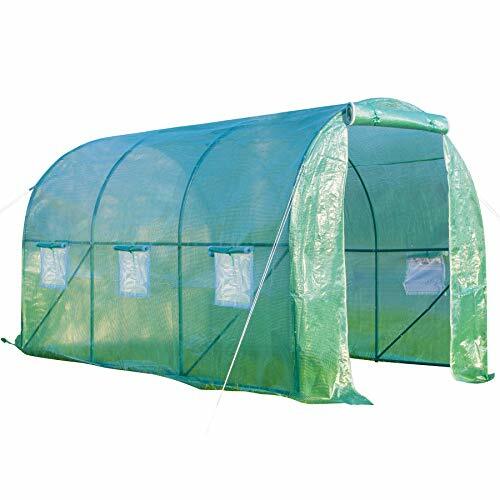 This high quality and portable tunnel green hot house will help you grow a beautiful garden. It comes with a durable transparent polyethylene covering for a long lasting use. Double zippered door and 8 Roll-up screen windows (4 on each side, also can be closed) make for both very easy access and provide air flow cross venting for those hot days. This large garden greenhouse is best for seeding, or protecting your young plants, lovely flowers from the cold weather conditions. The roof is not designed to hold the loads of standing water or snow. You must keep the roof material properly tight. Item need to be anchored securely to ground to hold against wind. We do not responsible for wind or storm damage to item, regardless anchoring and method. We are always try our best to provide excellent products and service,and located in America, provides extremely fast shipping. We are specialized in Home & Garden Products manufacturing, direct sale from manufacturer, lower price, higher quality and guarantee. Heavy duty transparent reinforced polyethylene cover material for maximum solar performance,100% UV protected & waterproof. 1 Double zippered front door + 6 exhaust vents for cross ventilation and venting on hot days. Green Powder coated steel frame and middle rails provide additional stability for this greenhouse. Overlong Cover Design makes greenhouse more airtight and secure, just bury it in the soil, easy way but useful. Idea for garden & backyard. This green hot house in your backyard extends your growing season no matter where you live.